дома » ARMENIAN - ENGLISH CONVERSATION GUIDE հայերեն անգլերեն զրուցարան » ՀԱՅԵՐԵՆ — ԱՆԳԼԵՐԵՆ ԶՐՈՒՑԱՐԱՆ: ԵՐՐՈՐԴ ՄԱՍ: ԱՊՐԱՆՔՆ ՈՒ ՆՐԱ ՈՐԱԿԸ: GOODS AND THEIR QUALITY. 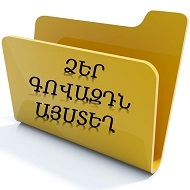 Ներբեռնել լավ որակով ( PDF) ԱՊՐԱՆՔՆ ՈՒ ՆՐԱ ՈՐԱԿԸ: GOODS AND THEIR QUALITY. գուդզ ընդ դէը քվոլըթի: (էջ 138-147). been sent by separate mail. inferior to that of the sample. best goods on the world market. This is best quality silk. The fabric doesn’t crumple at all. Previous post: ՀԱՅԵՐԵՆ — ԱՆԳԼԵՐԵՆ ԶՐՈՒՑԱՐԱՆ: ԵՐՐՈՐԴ ՄԱՍ: ԲԱՆԱԿՑՈՒԹՅՈՒՆՆԵՐ TALKS. Next post: ՀԱՅԵՐԵՆ — ԱՆԳԼԵՐԵՆ ԶՐՈՒՑԱՐԱՆ: ԵՐՐՈՐԴ ՄԱՍ: ԳՆԵՐ: PRICES.